The exchange of letters about Abdul Khaliq has led me to try to remember when I last saw him. It has just come back to me. 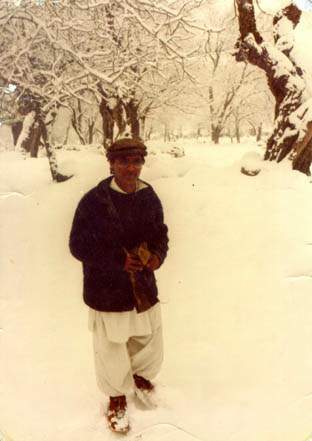 I last saw him in Peshawar in November, 1989. The reason I remember this clearly is that I was in University Town, Peshawar trying to find somebody (I cannot remember who). I knocked on a door at night. The man who answered said that this was the wrong address but asked me please to come in. I accepted his invitation and once inside he said that he had invited me in because I reminded him a lot of an man he had once met in jail in Afghanistan. We quickly realized that I was that man. The person occupying the house was Akhtar Jan. We had been political prisoners together in Jalalabad Prison in Afghanistan in July and August, 1978. We were both happy to see each other alive, especially since about half of the prisoners who had been in jail with us had been executed. The half who had not been executed had in most cases been released. I think that the prison was not in use any more. The house in University Town, Peshawar where Akhtar Jan was staying was owned by SERV, a Christian rescue and relief organization that was servicing the Afghan refugees. Akhtar Jan was working for SERV. With us was Adbul Khaliq, who also worked for SERV. Abdul Khaliq explained that he had converted to Christianity and was no longer Kalash. It was a fantastic coincidence that Akhtar Jan and Abdul Khaliq were both working for SERV together and both knew me from entirely different places and circumstances. I knew Akhtar Jan from being in prison with him in Afghanistan and I knew Abdul Khaliq because he had once offered and tried to arrange a marriage between myself and a beautiful Kalash girl in Bumboret Chitral named Afiyat. The reason that I now remember that this meeting with Akhtar Jan and Abdul Khaliq took place in November 1989 and not on some other date is that Akhtar Jan was applying to attend university in England. He asked me to write a letter of recommendation to an official in England explaining that Akhtar Jan had been in prison with me in Afghanistan, where we daily faced the possibility of being executed as many prisoners were being executed and that he had been very helpful to me during this time of distress. I then went back to my home in Fujairah, United Arab Emirates and wrote the letter to England and mailed a copy to Akhtar Jan at the SERV address. However, I never heard from Akhtar Jan again. The reason that I am now certain that this happened in November 1989 is that I kept a copy of that letter. Recently, SERV has been in the news because the SERV office in Kabul has been closed and SERV has been expelled from Afghanistan. Two American SERV employees have been seized and charged with distributing Christian propaganda. The news had also stated that several local employees of SERV have been detained in Afghanistan and their fate is unknown. Naturally, I am concerned that my two friends, Akhtar Jan and Abdul Khaliq, might still be working for SERV and might be in trouble now. Is there any way of finding out? "If I had been Sam Sloan, he would have arrested me on the spot"
Why do the Afghans protect Osama bin Laden?